Received December 6, 2015; Accepted December 9, 2015.; Published online January 25, 2016. Pure sequence-based analyses using full sequence, particularly when conducted iteratively, provide considerable information about conserved domains, residues and, in favorable cases, functions, but this latter extrapolation is often a “leap” in the absence of structural and/or functional characterization of a very similar orthologous protein. One approach to begin honing in on the most important regions of sequence, known as active site profiling (using the “Deacon Active Site Profiler” tool, or DASP), has been designed to enable extraction of functionally “rich” information from databases beginning with structural information for a group (e.g. 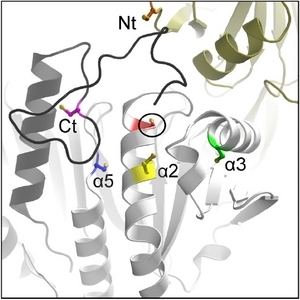 family or superfamily) of functionally-characterized proteins and some knowledge of their key residues around a function site (typically the active site) (Cammer et al., 2003). DASP requires the manual selection of “key residues” that define a functional site within a structurally characterized protein (typically the active site); for example, key residues used for peroxiredoxins included the three important residues in the PxxxT/SxxC motif and a conserved active-site Trp /Phe residue (Trp81 in Salmonella typhimurium AhpC). DASP then extracts the sequence fragments within 10 ? of the key residues (Fig. 1). These sequence motifs are concatenated to form an Active Site Signature which can be aligned with those of the other members of the family or class to form a subfamily-specific active site profile (ASP). A position specific scoring matrix created from this alignment can then be used to search sequence databases to identify new members (Fig. 1). Output from a DASP search includes a prioritized list of the best matches from a sequence database like GenBank(nr), clarifying relationships between protein sequences while taking advantage of the ever-deeper pool of sequence information available. Structural distinctions between subfamily members are also notable, some of which can be identified from sequences alone. For example, the α2 helix of Prx 5 proteins has an amino acid insertion that creates a characteristic “bulge” (or pi helix) (Perkins et al., 2015). Additionally, Prx1 and Prx6 group members have an extended C-terminus relative to the other groups. Studies of Prx1 group member interactions with other proteins have uncovered a significant role for the extended C-terminal tail in these proteins for promoting interactions with important redox partners. For eukaryotic Prx1 proteins which can be oxidatively damaged by high peroxide levels, repair of the hyperoxidized Cys at the active site is mediated by the protein sulfiredoxin (Srx) which interacts with the Prx “client” through an “embrace” during which the C-terminal tail of one monomer wraps around the Srx protein catalyzing repair of the other subunit of the dimer (J?nsson et al., 2008). In recent studies detailing interactions of a bacterial Prx known as AhpC with its electron-donating partner, AhpF, the extended C-terminus of AhpC from E. coli was also found to play an important role in mediating the protein-protein interactions needed for electron transfer between these proteins (Dip et al., 2014). Kinetic distinctions between classes are less clear as much remains to be discovered about how a wide range of Prxs function in terms of their substrate specificities and steady state and rapid reaction kinetic profiles. One obvious distinction in some cases is the reductant used to reduce the disulfide bond in oxidized Prxs and recycle the catalytic cysteine. Thioredoxins often function as the primary Prx reductant, although glutaredoxins are increasingly recognized as serving in this role for an array of Prxs. In addition, some Prxs have evolved significant specificity for their electron donors. Two excellent examples of this are from the Prx1 group. The first example includes the AhpC proteins from E. coli and Salmonella typhimurium which are reduced specifically by the specialized flavoprotein AhpF, mentioned above. Notably, the structural gene encoding AhpF is nearly always found within several hundred base pairs downstream of that encoding AhpC, and these AhpC-AhpF pairs are found in both Gram negative and Gram positive bacteria. Another case exhibiting specialization toward reductant is tryparedoxin peroxidase (TryP), another Prx1 group member, which is recycled in vivo by the thioredoxin-like reductant known as tryparedoxin. Tryparedoxins contain a CXXC motif and are found exclusively in kinetoplastids where they serve a similar role to thioredoxin and reduce tryparedoxin peroxidase, ribonucleotide reductase, and other regulatory proteins (Floh?, 2010). These organisms have unique redox systems in that they do not rely on glutathione as their prominent low molecular weight thiol, but rather a conjugated form of glutathione with two of the tri-peptides connected by a spermidine linker (Poole, 2015). This thiol, known as trypanothione, receives its electrons from NADPH via another specialized flavoprotein, trypanothione reductase, and is the source of electrons for recycling tryparedoxin, and thus TryP. Fig. 1. 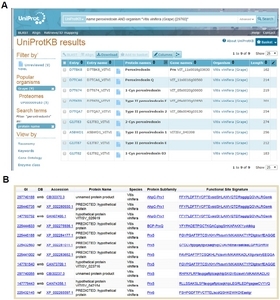 Identification of peroxiredoxin sequences using the Deacon Active Site Profiling (DASP) tool. (1) The active site of human Prx6 (PDB identifier 1prx) is shown with the four key residues highlighted in red. (2) Structural segments located within 10 ? of the center of geometry of the key catalytic residues are identified (each segment shown in a different color) and extracted from the global structure. (3) The sequence fragments are then combined to form a functional site signature (residue colors correspond to the color of structure segments in 2; key residues are highlighted in red). (4) Functional-site signatures for structurally characterized members of the Prx6 subfamily are aligned using ClustalW (; ) to create a functional site profile. 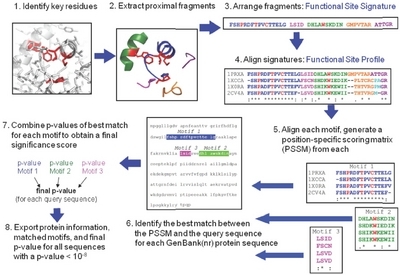 (5) Motifs are identified within any fragments that contain at least three residues and position specific scoring matrices (PSSM) () are created for each motif. (6) For each sequence in a user-selected sequence database, the PSSM for each motif is used to find and score the segment within a query sequence which best matches the motif. (7) Each time a motif is matched to a position in the protein sequence, a p-value is calculated that represents the probability of finding a match as good as the observed match within a random sequence. The p-values for all motifs in a single sequence are then combined using QFAST to obtain the final statistical significance score (final p-value) (). (8) The protein information (including accession numbers, annotations, and species), final p-value, and sequence fragments matched to each queried motif are exported for all sequences with a final p-value more significant than a user-selected p-value. This figure was adapted from . Fig. 2. Output from two web tools used to search for peroxiredoxins present in Vitis vinifera (grape). (A) shows the output from a search for “peroxiredoxin” and the organism name at . (B) shows the output from a parallel search conducted using the PREX database at . Fig. 3. Sequence alignments of V. vinifera Prxs of interest generated by PREX (A) or by multiple sequence alignments of all six true Prxs (B). 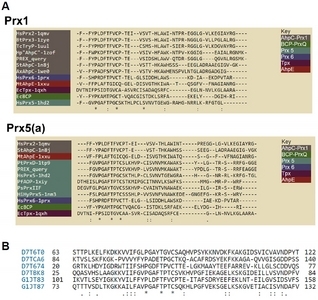 (A) shows two of the automatically-generated sequence alignments, accessed by clicking on an individual sequence signature in the output from a PREX search such as that depicted in . Note that the PREX query sequence (the signature that was selected) is shown aligned with several other members of the same subgroup as well as one representative from each of the other 5 subgroups. (B) depicts a section around the conserved active site sequence of the multiple sequence alignment of all six bona fide Prxs from V. vinifera, listed by their uniprot designation and aligned using Clustal W (; ). Fig. 4. Phylogenetic distribution of individual Prx groups across all species. The organism name for each Prx sequence was first extracted from the DASP output file and the complete lineage of each organism was obtained from the NCBI Taxonomy databases. This information was used to calculate the fraction of sequences within each subfamily that belong to the indicated biological subdivision. Each species was only counted once in each subfamily even if multiple protein sequences were identified. To prevent results being biased by oversampling of sequences from multiple bacterial strains, multiple strains of the same species were only counted once for each subfamily. The prevalence of cyan in the figure reflects the huge number of bacterial species compared to archaeal and eukaryotic species. Fig. 5. Variable locations of the resolving Cys (CR). Shown are the various positions of the peroxiredoxin CR (colored sidechains) in relation to the active site peroxidatic Cys (CP, circled and in red). Intramolecular CP-CR disulfides are formed for the α2 (yellow), α3 (green), and α5 (blue) types, and intermolecular disulfides are formed for the N-terminal (Nt, orange CR in the gold chain) and C-terminal (Ct, magenta CR in the black chain) types. (CR residues are mapped onto a composite structure based on S. typhimurium AhpC, Protein Databank Identifier 4MA9). Reproduced with permission from (). Fig. 6. 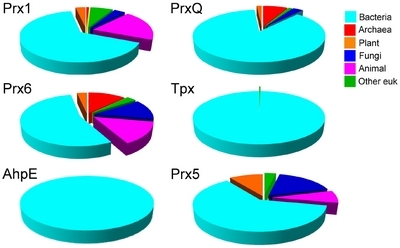 Dimeric interfaces and quaternary structures of Prxs. Homodimeric complexes are formed using either an A-type interface, where the monomers interact near helix α3, or B-type dimers where the interaction is through the β-strands, generating an extended 10?14 strand β-sheet. Further interactions at the A-interfaces of some Prx1 and Prx6 members generate (α2)5 decamers [or in rare cases (α2)6 dodecamers]. The blue subunit is displayed at approximately the same orientation in each of the structures to illustrate these interaction interfaces that together build the decamer. For a number of Prx1 members, the structural change upon disulfide bond formation destabilizes the A-type dimer interface, and the decamer dissociates to B-type dimers. 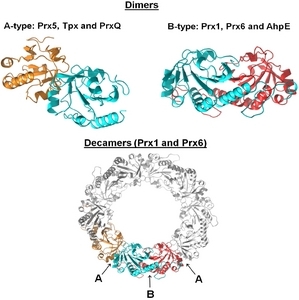 The structures depicted are: Aeropyrum pernix PrxQ (A-type dimer, Protein Data Bank Identifier 4GQF), and wild type S. typhimurium AhpC (B-type dimer and decamer, Protein Data Bank Identifier 4MA9). Adapted from (). Lower and upper case letters are used to distinguish different motifs within the PREX sequence signatures. The essential active site motif of Prxs is underlined in each active site signature. Floh?, L. (2010). Changing paradigms in thiology from antioxidant defense toward redox regulation. Methods Enzymol.. 473, 1-39. J?nsson, T.J., Johnson, L.C., and Lowther, W.T. (2008). Structure of the sulphiredoxin-peroxiredoxin complex reveals an essential repair embrace. Nature. 451, 98-101. Knoops, B., Loumaye, E., and Van der Eecken, V. (2007). Evolution of the peroxiredoxins: taxonomy, homology and characterization. In peroxiredoxin systems, Floh?, L., and Harris, J.R., ed. New York: Springer, pp. 27-40.